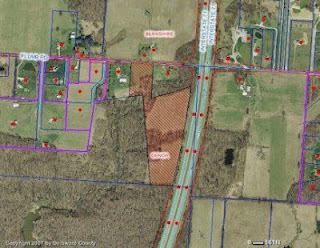 INCREDIBLY SCENIC & PRIVATE ~20 ACRE PARCEL…adjoining the Alum Creek State Park land & mountain bike trail! Gently rolling land with 2 creeks, ~2-3 acres of woods, ravines & ~14 acres of pasture. Delco water & electric available. Possible lot split for additional parcels/lots. Bring your horses! Close to Alum Creek, Polaris & freeways. The parcel is located on the south side of the street between 6196 & 6300 Plumb Rd. Big Walnut schools! Only $274,900! Call DeLena today!